Fewer than half of the 2013 graduating seniors who took the test got "college-ready" scores. The College Board considers a score of 1550 to be the “College and Career Readiness Benchmark.” Students who meet the benchmark are more likely to enroll in a four-year college, more likely to earn a GPA of a B- or higher their freshman year, and more likely to complete their degree. 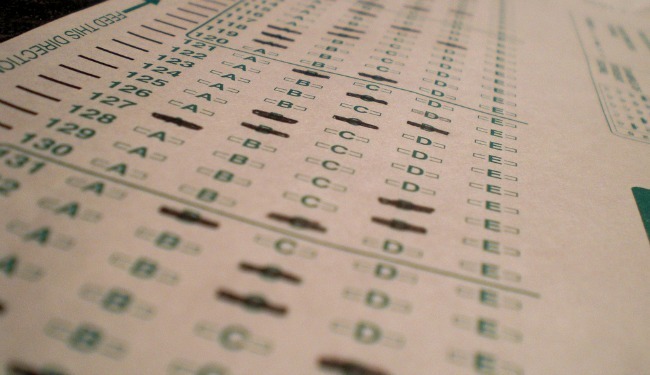 “While some might see stagnant scores as no news, the College Board considers them a call to action. These scores can and must change — and the College Board feels a sense of responsibility to help make that happen,” the report said. The report also offered insights into why some students graduated high school prepared for college and others didn’t. 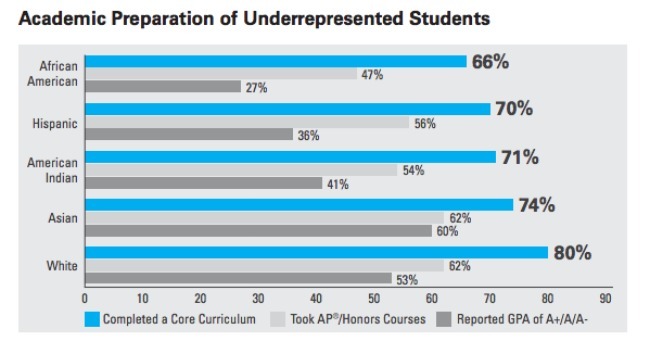 Students in the class of 2013 who met or exceeded the benchmark were more likely to have completed a core curriculum, to have taken honors or AP courses, and to have taken higher-level mathematics courses, like precalculus, calculus, and trigonometry. Although the SAT takers in the class of 2013 were the most diverse group of test takers ever, the report showed that minority students’ scores have only slightly improved in the past year. While 14.8 percent of African-American SAT takers met or exceeded the SAT benchmark in 2012, 15.6 percent met or exceeded the mark in 2013. Similar gains were made among Hispanic SAT takers: 23.5 percent met the benchmark in 2013, up from 22.8 in 2012. This may be due to differing academic preparation between the groups: Only 66 percent of African American students and 70 percent of Hispanic students completed a Core Curriculum, in comparison to 80 percent of white students.